14000 Fans Can’t Be Wrong! 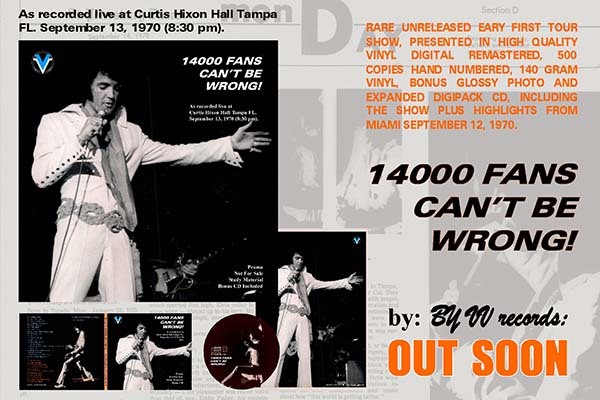 Out now on the VV label is their sixth release entitled "14000 fans Can’t be wrong!" featuring the UNRELEASED complete live audience recording on September 13th 1970 8.30 PM show From Tampa, Florida.. The vinyl will be accompanied from a deluxe digipack cd including the Show plus the almost previous day show from Miami + a bonus glossy PHOTO . After the success of our previous releases We decided: to give you more.….. so we decided to not only bring you an UNRELEASED show with best audio possible , but also an expanded cd in deluxe digipack with practically two shows!!! Elvis ‘ first tour comes almost immediately after the third Las Vegas season, maybe too soon to give Elvis time to recuperate…from a long and we suspect boring month of concerts in Vegas. The tour was a 8 concerts in 6 different cities. It was a modest tour considering Elvis’ popularity , in fact all the date were an immediately sold out with a wild reaction from the audience. Elvis looked great at the top of his possibility, performing a solid and maybe too short show with the best of the repertoire of the previous month in Vegas with no new songs added. About the Show, Elvis’ sang the two best singles from the 1969 sessions + plus his last one from the 1970 sessions…I’ve Lost You maybe for the moderate success only, won’t be performed anymore after this tour..In the Ghetto will follow the same destiny …. Talking about of the best song, all the songs a very well performed although sometime no too seriously, overall in the case of a serious one like In The Ghetto…however in “The new song” I’ve Lost You and You’ve Lost the Loving Feeling we find Elvis at his best… In the cd we include together the Tampa show also 30 minutes of Miami Evening show, giving to the listen a wider spectrum about Elvis’ first tour. The Miami show was already released but we have in our hands a straight copy from the original tape, so we decide to add the highlights of the show to complete the bonus cd in the matter to delivery 80 MINUTES OF music. Both the recording come from an early generation copy of the master tape, the sound quality is very good considering the early tour. We have on our hands the original mono tape of extremely good quality enabling us to carry out simple re-mastering work, concentrating on the reduction of noise trying to achieve a more clear sound of Elvis, keeping his vocal power up in the central mix and at the same time trying to give a great definition to the background music. The LP 140 VINYL GRAM, IT BRINGS TO THE BEST QUALITY TO DATE!!! !is a LIMITED HAND NUMBERED 500 COPIES. It comes with an CLASSIC SLEEVE AS OUR FIRST RELEASE, WITH A FEW BEAUTIFUL SHOTS FORM THE CONCERT giving an unique view. The bonus cd comes with expanded tracklist with a deluxe digipack . A bonus glossy heavy paper A/4 format comes to complete this beautiful package. We hope you can enjoy this SIXTH product in the way to give life to the next volume soon as possible. You are right. Just a copy&past from CD-r. But it is a lovely package. 14.000 ears cannot be wrong..either...the sound is crappy...forget it.